Gastrointestinal stromal tumors (GISTs) account for less than 1% of GI tumors, but they are the most common mesenchymal neoplasms of the GI tract. GISTs are usually found in the stomach or small intestine but can occur anywhere along the GI tract and rarely have extra-GI involvement. See the image below. Shown here is a gastric gastrointestinal stromal tumor (GIST). This is a gross specimen following partial gastrectomy. Note the submucosal tumor mass with the classic features of central umbilication and ulceration. Gastrointestinal stromal tumors (GISTs) account for less than 1% of GI tumors, with only about 5000 new cases expected annually in the United States. GISTs rank a distant third in prevalence behind adenocarcinomas and lymphomas among the histologic types of GI tract tumors. However, GISTs are the most common mesenchymal neoplasms of the GI tract. See the image below. Historically, these lesions were classified as leiomyomas or leiomyosarcomas because they possessed smooth muscle features when examined under light microscopy. In the 1970s, electron microscopy found little evidence of smooth muscle origin of these tumors. In the 1980s, with the advent of immunohistochemistry, it was shown that these tumors did not have immunophenotypic features of smooth muscle cells and rather expressed antigens related to neural crest cells. Mazur and Clark in 1983, and Schaldenbrand and Appleman in 1984, were the first to describe "stromal tumors" as a separate entity. The PDGFR alpha mutation seems to leave the PDGFRalpha receptor constitutively active and may represent an alternate pathway with activation of similar downstream signaling as the KIT receptor. The discovery of these receptor mutations has redefined the classification and management of the disease. This discovery has been celebrated as the example of the power of targeted, individualized therapy and has helped focus a great deal of attention on this orphan disease. The US Food and Drug Administration (FDA) approved imatinib for treatment of metastatic GIST in 2002 and for the adjuvant therapy of primary resected GIST in 2008. The FDA has also approved the newer tyrosine kinase inhibitors sunitinib and regorafenib for treatment of GISTs that are unresponsive to imatinib. GISTs are typically diagnosed as solitary lesions, although in rare cases (ie, pediatric type), multiple lesions can be found. These tumors have been reported to range in size from smaller than 1 cm to as large as 40 cm in diameter. GISTs can grow intraluminally or extraluminally toward adjacent structures. When the growth pattern is extraluminal, patients can harbor the disease symptom free for an extended period and present with very large exogastric masses. Distant metastases tend to appear late in the course of the disease in most cases. In contrast to other soft tissue tumors, the common metastatic sites of GISTs are the liver and peritoneum. Lymph node involvement is rare, occurring in only 0-8% of cases. However, in rare cases of pediatric GIST, lymph nodes are commonly involved, and distant metastasis is present at diagnosis. Despite these metastases, these variant GISTs have an indolent clinical course. Gastric GISTs carry a better prognosis than small bowel GISTs of similar size and mitotic rate. 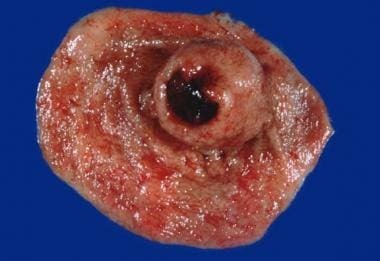 In general, gastric GISTs portend a much better prognosis than adenocarcinoma of the stomach. Even after complete resection of primary GIST, at least 50% of patients develop recurrence or metastasis, at a median time to recurrence of 2 years. This high rate of recurrence is in the setting of an overall 5-year survival rate of 50%. Larger GISTs are associated with complications such as GI hemorrhage, GI obstruction, and bowel perforation. Patients with advanced GISTs who are receiving tyrosine kinase inhibitor therapy may develop tumor-related intraluminal or intraperitoneal hemorrhage, rupture, fistula, or obstruction requiring emergent surgery. Ghanem N, Altehoefer C, Furtwängler A, Winterer J, Schäfer O, Springer O, et al. Computed tomography in gastrointestinal stromal tumors. Eur Radiol. 2003 Jul. 13 (7):1669-78. [Medline]. Zhou HY, Zhang XM, Zeng NL, Jian SH, Tang W. Use of conventional MR imaging and diffusion-weighted imaging for evaluating the risk grade of gastrointestinal stromal tumors. J Magn Reson Imaging. 2012 Dec. 36 (6):1395-401. [Medline]. Chak A, Canto MI, Rosch T, et al. Endosonographic differentiation of benign and malignant stromal cell tumors. Gastrointest Endosc. 1997 Jun. 45(6):468-73. [Medline]. DeMatteo RP, Ballman KV, Antonescu CR, et al. Adjuvant imatinib mesylate after resection of primary gastrointestinal stromal tumour: a randomized, double-blind, placebo-controlled trial. Lancet. March 28, 2009. 373:1097-1104. [Medline]. Kindblom LG, Remotti HE, Aldenborg F, Meis-Kindblom JM. Gastrointestinal pacemaker cell tumor (GIPACT): gastrointestinal stromal tumors show phenotypic characteristics of the interstitial cells of Cajal. Am J Pathol. 1998 May. 152 (5):1259-69. [Medline]. [Full Text]. Hirota S, Isozaki K, Moriyama Y, Hashimoto K, Nishida T, Ishiguro S, et al. Gain-of-function mutations of c-kit in human gastrointestinal stromal tumors. Science. 1998 Jan 23. 279 (5350):577-80. [Medline]. Kang HJ, Koh KH, Yang E, You KT, Kim HJ, Paik YK. Differentially expressed proteins in gastrointestinal stromal tumors with KIT and PDGFRA mutations. Proteomics. 2006 Feb. 6(4):1151-7. [Medline]. Medeiros F, Corless CL, Duensing A, Hornick JL, Oliveira AM, Heinrich MC. KIT-negative gastrointestinal stromal tumors: proof of concept and therapeutic implications. Am J Surg Pathol. 2004 Jul. 28(7):889-94. [Medline]. Miettinen M, Sobin LH, Sarlomo-Rikala M. Immunohistochemical spectrum of GISTs at different sites and their differential diagnosis with a reference to CD117 (KIT). Mod Pathol. 2000 Oct. 13(10):1134-42. [Medline]. Van Oosterom AT, Judson I, Verweij J, et al. STI 571, an active drug in metastatic gastrointestinal tumors (GIST), AN EORTC phase I study. Plenary Presentation. The American Society of Clinical Oncology, 37th Annual Meeting. 2001. Bauer S, Lang H, Schütte J, Hartmann JT. Complete remission with imatinib in metastastic gastrointestinal stromal tumors. J Clin Oncol. 2005 Sep 20. 23(27):6800-1; author reply 6801-2. [Medline]. Benjamin RS, Blanke CD, Blay JY, Bonvalot S, Eisenberg B. Management of gastrointestinal stromal tumors in the imatinib era: selected case studies. Oncologist. 2006 Jan. 11(1):9-20. [Medline]. Koh JS, Trent J, Chen L, et al. Gastrointestinal stromal tumors: overview of pathologic features, molecular biology, and therapy with imatinib mesylate. Histol Histopathol. 2004 Apr. 19(2):565-74. [Medline]. Maki RG. Gastrointestinal Stromal Tumors Respond to Tyrosine Kinase-targeted Therapy. Curr Treat Options Gastroenterol. 2004 Feb. 7(1):13-17. [Medline]. Melichar B, Voboril Z, Nozicka J, Ryska A, Urminská H, Vanecek T. Pathological complete response in advanced gastrointestinal stromal tumor after imatinib therapy. Intern Med. 2005 Nov. 44(11):1163-8. [Medline]. Miettinen M, Lasota J. Gastrointestinal stromal tumors--definition, clinical, histological, immunohistochemical, and molecular genetic features and differential diagnosis. Virchows Arch. 2001 Jan. 438(1):1-12. [Medline]. Miettinen M, El-Rifai W, H L Sobin L, Lasota J. Evaluation of malignancy and prognosis of gastrointestinal stromal tumors: a review. Hum Pathol. 2002 May. 33 (5):478-83. [Medline]. Fukasawa T, Chong JM, Sakurai S, Koshiishi N, Ikeno R, Tanaka A, et al. Allelic loss of 14q and 22q, NF2 mutation, and genetic instability occur independently of c-kit mutation in gastrointestinal stromal tumor. Jpn J Cancer Res. 2000 Dec. 91 (12):1241-9. [Medline]. Rege TA, Wagner AJ, Corless CL, Heinrich MC, Hornick JL. "Pediatric-type" gastrointestinal stromal tumors in adults: distinctive histology predicts genotype and clinical behavior. Am J Surg Pathol. 2011 Apr. 35(4):495-504. [Medline]. Ma GL, Murphy JD, Martinez ME, Sicklick JK. Epidemiology of gastrointestinal stromal tumors in the era of histology codes: results of a population-based study. Cancer Epidemiol Biomarkers Prev. 2015 Jan. 24 (1):298-302. [Medline]. [Full Text]. Tryggvason G, Gíslason HG, Magnússon MK, Jónasson JG. Gastrointestinal stromal tumors in Iceland, 1990-2003: the icelandic GIST study, a population-based incidence and pathologic risk stratification study. Int J Cancer. 2005 Nov 1. 117 (2):289-93. [Medline]. Goettsch WG, Bos SD, Breekveldt-Postma N, Casparie M, Herings RM, Hogendoorn PC. Incidence of gastrointestinal stromal tumours is underestimated: results of a nation-wide study. Eur J Cancer. 2005 Dec. 41 (18):2868-72. [Medline]. Rubió J, Marcos-Gragera R, Ortiz MR, Miró J, Vilardell L, Gironès J, et al. Population-based incidence and survival of gastrointestinal stromal tumours (GIST) in Girona, Spain. Eur J Cancer. 2007 Jan. 43 (1):144-8. [Medline]. Nilsson B, Bümming P, Meis-Kindblom JM, Odén A, Dortok A, Gustavsson B, et al. Gastrointestinal stromal tumors: the incidence, prevalence, clinical course, and prognostication in the preimatinib mesylate era--a population-based study in western Sweden. Cancer. 2005 Feb 15. 103 (4):821-9. [Medline]. Hirota S, Isozaki K. Pathology of gastrointestinal stromal tumors. Pathol Int. 2006 Jan. 56(1):1-9. [Medline]. Rubin BP, Singer S, Tsao C, Duensing A, Lux ML, Ruiz R, et al. KIT activation is a ubiquitous feature of gastrointestinal stromal tumors. Cancer Res. 2001 Nov 15. 61 (22):8118-21. [Medline]. Agaimy A, Terracciano LM, Dirnhofer S, Tornillo L, Foerster A, Hartmann A, et al. V600E BRAF mutations are alternative early molecular events in a subset of KIT/PDGFRA wild-type gastrointestinal stromal tumours. J Clin Pathol. 2009 Jul. 62 (7):613-6. [Medline]. [Guideline] ESMO/European Sarcoma Network Working Group. Gastrointestinal stromal tumours: ESMO Clinical Practice Guidelines for diagnosis, treatment and follow-up. Ann Oncol. 2014 Sep. 25 Suppl 3:iii21-6. [Medline]. [Full Text]. Carney JA. Gastric stromal sarcoma, pulmonary chondroma, and extra-adrenal paraganglioma (Carney Triad): natural history, adrenocortical component, and possible familial occurrence. Mayo Clin Proc. 1999 Jun. 74 (6):543-52. [Medline]. Graadt van Roggen JF, van Velthuysen ML, Hogendoorn PC. The histopathological differential diagnosis of gastrointestinal stromal tumours. J Clin Pathol. 2001 Feb. 54(2):96-102. [Medline]. King DM. The radiology of gastrointestinal stromal tumours (GIST). Cancer Imaging. 2005. 5:150-6. [Medline]. Yamashita F, Sasatomi E, Kiyama M, Fukumori K, Yano Y, Kato O, et al. Radiographic observation of a case of gastrointestinal stromal tumor in stomach. Kurume Med J. 2001. 48 (3):233-6. [Medline]. Stroobants S, Goeminne J, Seegers M, Dimitrijevic S, Dupont P, Nuyts J, et al. 18FDG-Positron emission tomography for the early prediction of response in advanced soft tissue sarcoma treated with imatinib mesylate (Glivec). Eur J Cancer. 2003 Sep. 39 (14):2012-20. [Medline]. Palazzo L, Landi B, Cellier C, et al. Endosonographic features predictive of benign and malignant gastrointestinal stromal cell tumours. Gut. 2000 Jan. 46(1):88-92. [Medline]. [Guideline] NCCN Clinical Practice Guidelines in Oncology. Soft Tissue Sarcoma: Version 2.2016. National Comprehensive Cancer Network. Available at http://www.nccn.org/professionals/physician_gls/pdf/sarcoma.pdf. Accessed: April 22, 2016. Fields S, Libson E. CT-guided aspiration core needle biopsy of gastrointestinal wall lesions. J Comput Assist Tomogr. 2000 Mar-Apr. 24(2):224-8. [Medline]. Kikuchi H, Yamashita K, Kawabata T, Yamamoto M, Hiramatsu Y, Kondo K. Immunohistochemical and genetic features of gastric and metastatic liver gastrointestinal stromal tumors: sequential analyses. Cancer Sci. 2006 Feb. 97(2):127-32. [Medline]. Montgomery E, Abraham SC, Fisher C, et al. CD44 loss in gastric stromal tumors as a prognostic marker. Am J Surg Pathol. 2004 Feb. 28(2):168-77. [Medline]. Franquemont DW. Differentiation and risk assessment of gastrointestinal stromal tumors. Am J Clin Pathol. 1995 Jan. 103(1):41-7. [Medline]. Tzen CY, Mau BL. Analysis of CD117-negative gastrointestinal stromal tumors. World J Gastroenterol. 2005 Feb 21. 11(7):1052-5. [Medline]. Rutkowski P, Wozniak A, Debiec-Rychter M, et al. Clinical utility of the new American Joint Committee on Cancer staging system for gastrointestinal stromal tumors: current overall survival after primary tumor resection. Cancer. 2011 Nov 1. 117(21):4916-24. [Medline]. Rutkowski P, Wozniak A, Debiec-Rychter M, et al. Clinical utility of the new american joint committee on cancer staging system for gastrointestinal stromal tumors: Current Overall Survival After Primary Tumor Resection. Cancer. 2011 Mar 31. [Medline]. Joensuu H, Roberts PJ, Sarlomo-Rikala M, et al. Effect of the tyrosine kinase inhibitor STI571 in a patient with a metastatic gastrointestinal stromal tumor. N Engl J Med. 2001 Apr 5. 344(14):1052-6. [Medline]. Tuveson DA, Willis NA, Jacks T, et al. STI571 inactivation of the gastrointestinal stromal tumor c-KIT oncoprotein: biological and clinical implications. Oncogene. 2001 Aug 16. 20(36):5054-8. [Medline]. Pisters PW, Patel SR. Gastrointestinal stromal tumors: current management. J Surg Oncol. 2010 Oct 1. 102 (5):530-8. [Medline]. Demetri GD, van Oosterom AT, Garrett CR, Blackstein ME, Shah MH, Verweij J, et al. Efficacy and safety of sunitinib in patients with advanced gastrointestinal stromal tumour after failure of imatinib: a randomised controlled trial. Lancet. 2006 Oct 14. 368 (9544):1329-38. [Medline]. Verweij J, Casali PG, Zalcberg J, LeCesne A, Reichardt P, Blay JY. Progression-free survival in gastrointestinal stromal tumours with high-dose imatinib: randomised trial. Lancet. 2004 Sep 25-Oct 1. 364(9440):1127-34. [Medline]. Joensuu H, Eriksson M, Hatrmann I, et al. Twelve versus 36 months of adjuvant imatinib (IM) as treatment of operable GIST with a high risk of recurrence: Final results of a randomized trial (SSGXVIII/AIO). 2011 American Society of Clinical Oncology (ASCO) Annual Meeting. Abstract LBA1. Presented June 5, 2011. Demetri GD, Reichardt P, Kang YK, Blay JY, Rutkowski P, Gelderblom H, et al. Efficacy and safety of regorafenib for advanced gastrointestinal stromal tumours after failure of imatinib and sunitinib (GRID): an international, multicentre, randomised, placebo-controlled, phase 3 trial. Lancet. 2013 Jan 26. 381(9863):295-302. [Medline]. Wu L, Zhang Z, Yao H, Liu K, Wen Y, Xiong L. Clinical efficacy of second-generation tyrosine kinase inhibitors in imatinib-resistant gastrointestinal stromal tumors: a meta-analysis of recent clinical trials. Drug Des Devel Ther. 2014. 8:2061-7. [Medline]. [Full Text]. Boni L, Benevento A, Dionigi G, Rovera F, Dionigi R. Surgical resection for gastrointestinal stromal tumors (GIST): experience on 25 patients. World J Surg Oncol. 2005. 3:78. [Medline]. Bucher P, Egger JF, Gervaz P, Ris F, Weintraub D, Villiger P. An audit of surgical management of gastrointestinal stromal tumours (GIST). Eur J Surg Oncol. 2006 Apr. 32(3):310-4. [Medline]. Knoop M, St Friedrichs K, Dierschke J. Surgical management of gastrointestinal stromal tumors of the stomach. Langenbecks Arch Surg. 2000 Apr. 385(3):194-8. [Medline]. Kosmadakis N, Visvardis EE, Kartsaklis P, Tsimara M, Chatziantoniou A, Panopoulos I. The role of surgery in the management of gastrointestinal stromal tumors (GISTs) in the era of imatinib mesylate effectiveness. Surg Oncol. 2005 Aug. 14(2):75-84. [Medline]. Lehnert T, Sinn HP, Waldherr R, Herfarth C. Surgical treatment of soft tissue tumors of the stomach. Eur J Surg Oncol. 1990 Aug. 16(4):352-9. [Medline]. Peiper M, Schroder S, Zornig C. Stromal sarcoma of the stomach--a report of 20 surgically treated patients. Langenbecks Arch Surg. 1998 Dec. 383(6):442-6. [Medline]. Katai H, Sasako M, Sano T. Wedge resection of the stomach for gastric leiomyosarcoma. Br J Surg. 1997 Apr. 84(4):560-1. [Medline]. Eisenberg BL, Judson I. Surgery and imatinib in the management of GIST: emerging approaches to adjuvant and neoadjuvant therapy. Ann Surg Oncol. 2004 May. 11(5):465-75. [Medline]. Rutkowski P, Nowecki Z, Nyckowski P, Dziewirski W, Grzesiakowska U, Nasierowska-Guttmejer A. Surgical treatment of patients with initially inoperable and/or metastatic gastrointestinal stromal tumors (GIST) during therapy with imatinib mesylate. J Surg Oncol. 2006 Mar 15. 93(4):304-11. [Medline]. Chen H, Pruitt A, Nicol TL, et al. Complete hepatic resection of metastases from leiomyosarcoma prolongs survival. J Gastrointest Surg. 1998 Mar-Apr. 2(2):151-5. [Medline]. Chen YH, Liu KH, Yeh CN, Hsu JT, Liu YY, Tsai CY, et al. Laparoscopic resection of gastrointestinal stromal tumors: safe, efficient, and comparable oncologic outcomes. J Laparoendosc Adv Surg Tech A. 2012 Oct. 22 (8):758-63. [Medline]. Aogi K, Hirai T, Mukaida H, et al. Laparoscopic resection of submucosal gastric tumors. Surg Today. 1999. 29(2):102-6. [Medline]. Bedard EL, Mamazza J, Schlachta CM, Poulin EC. Laparoscopic resection of gastrointestinal stromal tumors: not all tumors are created equal. Surg Endosc. 2006 Mar. 20(3):500-3. [Medline]. Hindmarsh A, Koo B, Lewis MP, Rhodes M. Laparoscopic resection of gastric gastrointestinal stromal tumors. Surg Endosc. 2005 Aug. 19(8):1109-12. [Medline]. Kitano S, Shiraishi N. Minimally invasive surgery for gastric tumors. Surg Clin North Am. 2005 Feb. 85(1):151-64, xi. [Medline]. Nguyen SQ, Divino CM, Wang JL, Dikman SH. Laparoscopic management of gastrointestinal stromal tumors. Surg Endosc. 2006 May. 20(5):713-6. [Medline]. Rosen MJ, Heniford BT. Endoluminal gastric surgery: the modern era of minimally invasive surgery. Surg Clin North Am. 2005 Oct. 85(5):989-1007, vii. [Medline]. Piessen G, Lefèvre JH, Cabau M, et al. Laparoscopic Versus Open Surgery for Gastric Gastrointestinal Stromal Tumors: What Is the Impact on Postoperative Outcome and Oncologic Results?. Ann Surg. 2015 Nov. 262 (5):831-40. [Medline]. Fletcher CDM, Bridge JA, Hogendoorn P, Mertens F. World Health Organization Classification of Tumours of Soft Tissue and Bone. 4th Ed. Lyon, France: IARC; 2013. Trojani M, Contesso G, Coindre JM, Rouesse J, Bui NB, de Mascarel A, et al. Soft-tissue sarcomas of adults; study of pathological prognostic variables and definition of a histopathological grading system. Int J Cancer. 1984 Jan 15. 33 (1):37-42. [Medline]. Costa J, Wesley RA, Glatstein E, Rosenberg SA. The grading of soft tissue sarcomas. Results of a clinicohistopathologic correlation in a series of 163 cases. Cancer. 1984 Feb 1. 53 (3):530-41. [Medline]. Edge SB, Byrd DR, Compton CC, et al. Soft Tissue Sarcoma. AJCC Cancer Staging Manual. 7th Ed. Springer; 2010. 291-296. Aparicio T, Boige V, Sabourin JC, Crenn P, Ducreux M, Le Cesne A. Prognostic factors after surgery of primary resectable gastrointestinal stromal tumours. Eur J Surg Oncol. 2004 Dec. 30(10):1098-103. [Medline]. Koga H, Ochiai A, Nakanishi Y, et al. Reevaluation of prognostic factors in gastric leiomyosarcoma. Am J Gastroenterol. 1995 Aug. 90(8):1307-12. [Medline]. Ng EH, Pollock RE, Romsdahl MM. Prognostic implications of patterns of failure for gastrointestinal leiomyosarcomas. Cancer. 1992 Mar 15. 69(6):1334-41. [Medline]. Fletcher CD, Berman JJ, Corless C, Gorstein F, Lasota J, Longley BJ, et al. Diagnosis of gastrointestinal stromal tumors: A consensus approach. Hum Pathol. 2002 May. 33 (5):459-65. [Medline]. Gold JS, Gönen M, Gutiérrez A, Broto JM, García-del-Muro X, Smyrk TC, et al. Development and validation of a prognostic nomogram for recurrence-free survival after complete surgical resection of localised primary gastrointestinal stromal tumour: a retrospective analysis. Lancet Oncol. 2009 Nov. 10 (11):1045-52. [Medline]. Sineshaw HM, Jemal A, Lin CC, McGinnis LS, Ward EM. Contemporary Patterns and Survival Outcome of Adjuvant Systemic Therapy for Localized Gastrointestinal Stromal Tumors. Am J Clin Oncol. 2015 Jan 16. [Medline]. CT scan of the abdomen with oral contrast in a 60-year-old woman with a gastric gastrointestinal stromal tumor (GIST). A huge mass with central necrosis is observed originating from the gastric wall and narrowing its lumen. An ulcer crater can be identified within the mass (arrow). Photomicrograph of gastrointestinal stromal tumor (GIST) stained with hematoxylin and eosin (H&E) and magnified 40X. Note the solid sheet of spindle cells. Photomicrograph of gastric gastrointestinal stromal tumor (GIST) stained with hematoxylin and eosin (H&E) and magnified 400X. This stromal tumor demonstrates spindle cells with epithelioid features. Photomicrograph of gastrointestinal stromal tumor (GIST) with immunohistochemical staining for CD117. Note the strong positive staining of tumor cells with negative staining of the adjacent vessel. Positive stain for CD117 is diagnostic of GIST.